Not my fault the cat mother didn't get me a new jersey. You and Daisy can have a "Girls in BowTies Day." Ha. Who let the children out? hee hee hee! *rolls on floor, grasping tummy* You cats are sooo funny! I love this idea! 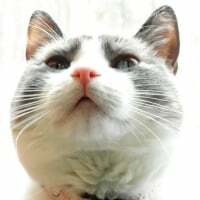 And if I may be so bold, perhaps the "seasoned citizens" of Catster could take a bus trip adventure someplace fun and interesting for Old Furts Day. It wouldn't be a requirement for Furts to go, but it might be a great way to celebrate. There are two Toonces' in the Olde Furts group. As long as neither one of them is driving, I might consider getting on a bus. It is kind of an Old Furt thing to do, isn't it? You young uns fly on a jet across the country in just a few hours BUT we Old Furts like to slow down and take time to enjoy all the sights. And leave the driving to . . . anyone but Toonces! "Senior Sit-izens" is pretty cute! Scooter, have you ever driven with Apollo? aaaaaaaag. MOL!!!!!!! Don't let Max drive either! We'll end up at Elsa's house - he could not resist! I think Scooter has one of those electric chairs. ) All I have is a palanquin. Sarge and I think this is a great idea. We're both 15!